This is my latest single ‘No Girl In Tennessee’. It features Preben Raunsbjerg on Guitar and Richard Sadler on Bass. I recorded it at Hot Tomale Recording and it’s available on Spotify and iTunes. It was mixed and mastered at Chesham Woods Studio by Preben Raunsbjerg. I have one more track to release - which will be happening in the next few weeks,, then I start work on a new album. We’re a bit light on gigs at the moment due to the amount of projects we’ve all got slated, but we have plans in place after the new album is recorded and released so we’ll get a chance to get out and about! Hope to see you at a gig soon! Our venue for ’The Rockford File’, performed by myself and Jonathan Holloway. Jonathan and I co-wrote the show with our director Giles Croft. The Summer of 2018 was mostly spent writing, rehearsing and performing a show at The Edinburgh Festival as well as doing several previews in London theatres. It was some years since I’d performed at the festival. The last time being in 1990- I think - when John Otway and myself did a show at The Assembly Rooms for a week. I remember on one gig falling off his shoulders whilst playing the guitar, and being unable to move the right side of my body for a few hours. It was a bit worrying for a while until I was ale to walk again, but you’ve got to expect that sort of thing when you’re creating great art. This time the show was a play with music based around a couple of blokes trying to do something constructive with their lives - like robbing a venue at The Edinburgh Festival in fact. I wrote some songs for the show and it went really well. I’m presently working on another show for the Edinburgh Festival in 2020. Played some great gigs with some wonderful musicians in 2018. Pete Pritchard, Preben Raunsbjerg, Neil Bullock, Richard Sadler, Martin Belmont, Kevin Foster, Alan Cook, Eric Ranzoni, Jimmy Russell to name but a few, and I once more rejoined My Darling Clementine for some London dates. I did quite a few online sessions too which I really enjoy doing, and finished off an album project in my studio with a good friend of mine Colin Little, I also completed a couple of new tracks of my own. I think 2019 will be interesting for lots of reasons! Just a quick reminder for our gig at Queens Theatre Hornchurch on 23rd April..Yes it's a Monday night and St George's Day too (To Book Click Here). We'll be playing stuff a little more bluesy and New Orleansy this time around. Some Allen Toussaint, Fats Domino and a little Dr John etc. as well as Bobby Charles of course - we'll allow Abbeville Louisiana! 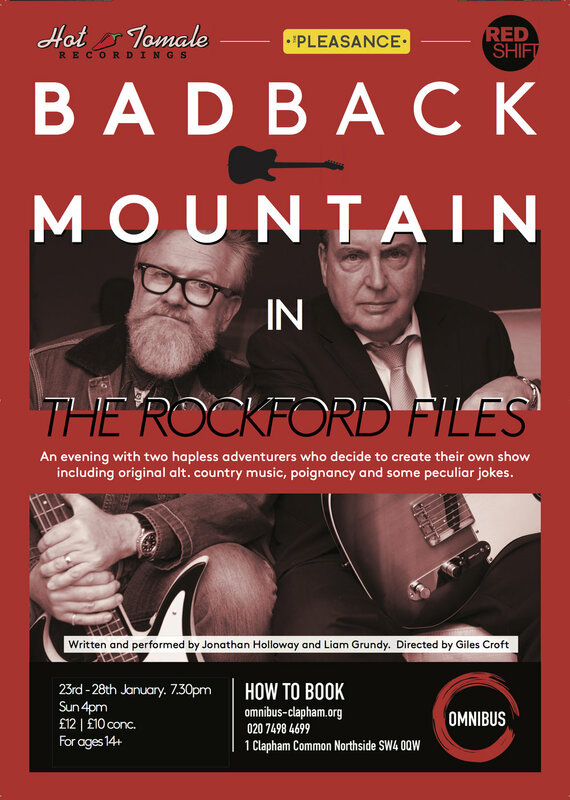 I'm writing some new material for our Edinburgh Festival show, 'Badback Mountain - The Rockford Files' which a lot of people came to see during our week's run in London in January. Thanks to all who came along. Our venue at the festival has been confirmed as the Jack Dome at The Pleasance Dome. Our show starts at 14.50 which leaves plenty of time before and after for whatever else takes your fancy! I will post a link for ticket sales as soon as they become available. Thanks to everyone who came to The Omnibus Theatre for my show 'The Rockford Files'. It was great working with Jonathan Holloway and Giles Croft. We had a lot of laughs. It was a great week and lovely to see so many familiar faces, as well as new audience members. 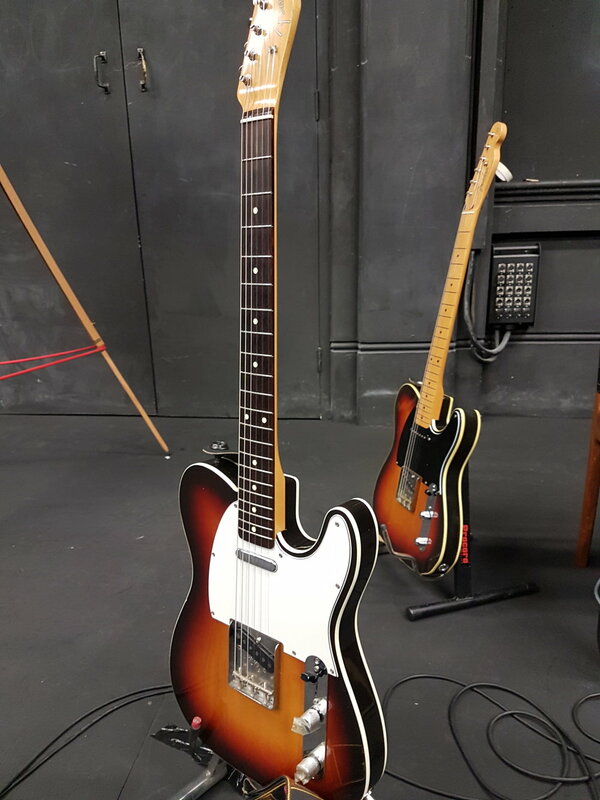 The telecasters got an outing, which I hope they enjoyed, I know I did! For the rest of the year, I'll be working hard in the studio on a new album, and working on some recordings for other folk. I've been exchanging audio files back and forth for various projects, so I have put tracks on recordings without needing to leave the grounds. Cuts down on the mileage! There are some more shows coming up and I will post these as soon as they are confirmed. My gig at The Queens Theatre Hornchurch on 23 April 2018 will feature Richard Sadler - Double Bass, Preben Raunsbjerg - Guitar, Martin Belmont - Guitar and Neil Bullock - Drums. Really looking forward to it! See you there! All the best for 2018 to everyone, and thanks for all your messages of support, for downloading tracks and coming along to the gigs. 2017 was great in lots of respects. I played some great gigs in a variety of settings and apart from working with my own band, I toured with My Darling Clementine to support the album we recorded in 2016 'Still Testifying'. I enjoyed working with Oo Bop Sh'Bam too, playing roadhouse R'nB for a change! One of the highlights of 2017 was getting to play with Mickey Jupp and Mo Witham at a gig in Eskdale. Mickey plays and sings great, and is still writing brilliant songs - Mo is still playing fantastic guitar - An honour! In 2017 I returned to Queens Theatre Hornchurch for a great gig and will be returning there on 23 April 2018 - book here! I'll have Preben Raunsbjerg, Martin Belmont, Richard Sadler and Neil Bullock along too. We'll be playing a few New Orleans Soul numbers this time. The big news is I've joined forces with my old friend and renowned writer and director Jonathan Holloway in a play called BADBACK MOUNTAIN "The Rockford Files". It's a two-hander. We've both written it, and we're both in it and there's some songs too. Tickets are on sale here Omnibus Theatre Clapham. Starts 23 January for a week, then we'll be at The Pleasance for The Edinburgh Fringe Festival 2018. I'll keep posting any new dates/developments here as they occur. Easter believe it or not! Looking forward to seeing everyone at Queens Theatre on Easter Sunday 16 April - see gig page for tickets. We've quite a few friends coming over from Sweden and Norway too so we'll have a great time. There's some new live tracks on YouTube with newly mastered sound, they're on the video page.Preben Raunsbjerg mixed the tracks to perfection, and it sounds just how I hoped it might! Wonderful playing on them from Neil Bullock and Richard Sadler and of course Preben too - take a look. We're back at Bulls Head Barnes on 18 May, so hope to see you all there. We had a good crowd last time, so it should be a lot of fun. Still writing and recording new stuff and working some sessions for other folks. Also playing some more gigs this year with My Darling Clementine to launch the album we recorded last year 'Still Testifying'. We're playing The Red Rooster Festival and The Islington in London in June amongst others. I'll put the dates up soon. Join me on Twitter and Instagram or my public Facebook page if you want any more on the move info. The Edinburgh Show I mentioned will now be 2018, which will mean we can do it on a larger scale. All under wraps at the moment.